Speedwell Weather has what is believed to be one of the largest private sector databases of high quality world-wide weather data. We are a single point of contact for the provision of weather data to the energy, agriculture, commodity, insurance and weather risk markets. Weather data supplied by Speedwell Weather comes from official bodies, sourced via direct data supply agreements with a large range of national meteorological and hydrographic services rather than just publicly available free data offered by many other suppliers. Speedwell Weather is the dominant provider of weather data for settlement of weather-risk contracts world-wide. Our origins as a weather data provider lie in the weather risk market. As a result, we understand the importance of data quality. We quality control data from thousands of sites to correct errors and, where necessary and possible, fill missing values. Over the years we have come across a lot of bad weather data! As a matter of policy, for reasons of quality, we do not deliver data derived from GSOD archives (unless specifically requested). If you see a difference between the data we provide and data sourced from other sources we will not be surprised. There is a lot of bad data out there!!!! Please contact us for a detailed explanation of the pitfalls of some commonly used public archives of weather data. These can be different not just in detail but fundamentally. Click here for more information on the limitation of the GSOD weather data set. Speedwell SuperPack makes available an unprecedented range of quality historical weather data and weather data feeds for a single annual fee. The SuperPack licence applies corporate-wide across multiple office locations: One contract, one fee, covers all data. SuperPack users have immediate access to a catalogue of many thousands of data sets - and growing. These data sets are shown on the Data Inventory Map Tool. Use this tool to see percentage completeness statistics, to access data tools such as Actuals-Vs-Climatology and the Weather Statistics Extractor; and to download the data directly from the web site. Subscribers can request an unlimited number of historical data sets and real-time feeds by FTP. The list of weather sites available for immediate access is continuously growing: In addition, SuperPack subscribers can also request any data from our secondary archives of many tens of thousands of weather sites around the world. SuperPack offers a dramatic simplification of the contractual and legal admin involved in data provision. Click here for more details on SuperPack®. Weather data is often incomplete and may contain erroneous values. Our Cleaned Data Sets correct erroneous values and fill missing data. We carry over 11,000 cleaned historical data sets of temperature and rainfall, amongst other variables and we clean over 5,000 sites per day. We also provide cleaned hourly data sets and feeds. We believe data quality control ("Cleaning") is a very serious business. Our origins as a weather data provider lie in the weather risk markets where we have acted as settlement agent in hundreds of over-the-counter weather risk transactions. This represents the sternest test of data quality and provenance. We see weather data as a type of financial market data. Our cleaning techniques build on a very substantial software, hardware and human resource infrastructure which builds on a database storing daily and hourly data for over over 100,000 worldwide weather reference sites. Our tools alert us to improbable values by the use of methods including proxy testing, analysis of hourly reports and satellite imagery. However, we believe weather data cleaning can never, and should never, be fully automated. Our data cleaning processes are always manually overseen by meteorologists. We are able to provide hourly frequency reports for any hourly weather variable and for any period. The most frequently requested product is the hourly frequency report covering a specific year and shown by month. This shows how many hours in temperature interval were recorded in each month of that year. Click here for an annotated example. Hourly Frequency Reports can be provided for any variable for any site for which we carry hourly data. We carry historic hourly data for many thousands of sites in Europe, Australia, Asia and the Americas. Many clients approach us to buy hourly data which they use to calculate an average value for each hour for each day of the year. This is something we can provide saving the costs of buying and handling large hourly data sets. The output is a file with 24*366 data points and can be delivered by FTP or by email. This can be provided for any variable for any site for which we carry hourly data. The average can be calculated with or without kernel smoothing. The average can be based on any period with 10 years being the most requested. 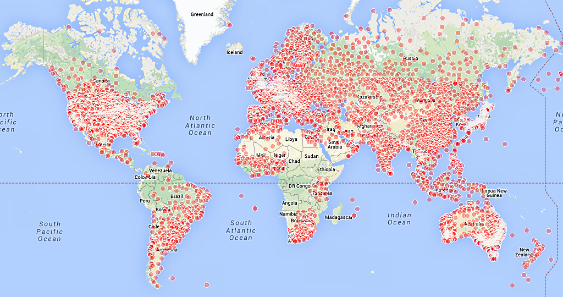 We carry historic hourly data for many thousands of sites in Europe, Australia, Asia and the Americas. Click here for more information on Climatologies. European Wind storms: Historic data and real-time feeds. We offer an archive of maximum gust, average wind speed and wind direction from 1970. This has an exceptionally high granularity and includes sub-hourly reports. We can provide hourly data updates by FTP to support verification of insurance claims or for the valuation of CAT-bonds throughout the year. The variables we can supply are hourly maximum gust, hourly average wind speed, hourly wind direction and hourly surface pressure. Data is based on both METAR and Synoptic reports. Click here for more information on European Wind storms. Standard Historical Weather Data Packs. We have over 1,000 different packs of weather data. These include packs defined by country, by sector (e.g. China cotton growing areas) or by weather variable (e.g. hourly Germany data pack for power market analysts). These data packs can be viewed on our map tool. All sites are also available individually. Weather Data Packs by Region Click here for a map viewer or our data packs, including inventory statistics. Agri-Weather: Weather Data Packs for Agriculture Click here to see our selection of data packs covering agri regions. Please also see hourly country data packs above or where not separately listed the main country pack. We offer a very wide range of population weighted temperature and rainfall products. These are used to model energy demand. For each basket we are able to provide the historical data set, daily feeds and a fully downscaled ensemble forecast. We also provide smoothed climatologies. Click here to see the sites which are used for each Population Weighted basket. We carry hourly weather data for thousands of sites around the world and can provide real-time feeds. Hourly data can be cleaned on request. We can provide reports for any site summarising the number of hours in each temperature bucket by month / year. Click here for an example. Please also contact us for Daily Station Reports, Monthly Summary Data and Rainfall Return Periods data..
We pride ourselves on being able to satisfy the most testing requests for weather data from our archives of over 100,000 data sets. Data can be delivered by email, FTP or through our web-download tool. We can provide data feeds of sub hourly, hourly and daily data for any weather variable. Speedwell Recalibrated Datasets re-base historical temperature data for important reference sites by adjusting for known or observed discontinuities that have accumulated over the lifetime of the observations. Discontinuities may arise from instrumentation changes or changes in the location of the measuring instruments. Subscribers to to the Recalibrated Data product are provided with access to a web-delivered tool for highlighting possible discontinuities as they happen in the reporting of temperature. The relationship of a reference site to a synthetic site derived from a basket of surrounding sites is monitored in real-time with information presented in a configurable graphical format.